Welcome to my Krypt. 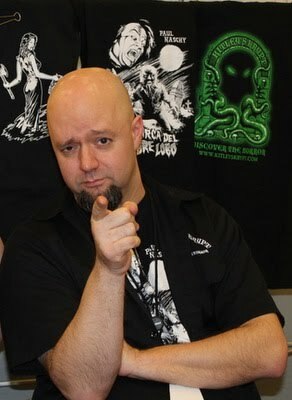 My name is Jon Kitley and I am your host, owner/operator, and head corpse at Kitley’s Krypt. Before we get to this site, let me give you a little background on myself first. I think it started back in 1971, when I used to watch Ghost Story on TV. Then the following year the show’s name was changed to Circle of Fear. I didn’t know if then, but I think the tumor of obsession started to develop, even at the young age of 6 years old. When I was 8, I have vivid memories of watching the made-for-TV movie Frankenstein: The True Story over a period of two nights, and being completely enthralled by it. But while the tumor still grew, it didn’t become malignant until the very early 80’s. And by then there was no hope of a cure. I was too far gone. Over the years, as I delved deeper and deeper in the horror genre, I discovered the massive history that lies there in, almost like a never-ending dark chasm filled with hours upon hours of devilish delights. And the farther down that hole that I traveled, I started to develop a love and appreciation of many different sub-genres of the horror field, whether it be horrors from south of the borders, the low budget classics from Roger Corman and AIP, Hammer horror, the Universal classics, the films of Paul Naschy, or the Italian horror genre, with Bava, Fulci, and Argento leading the way. I try to be open to anything in the horror genre. If you limit your tastes, you will miss out some some incredible films that are out there, just waiting to be discovered by a pair of unseen eyes and willing mind. Actor Vincent Price said it best when he stated, “A man who limits his interests limits his life.” We couldn’t agree more. When I started to seriously get into the genre, around in the mid-80’s, video stores were everywhere. Being in a pretty big size city, usually if it was on video, I could find it in one of the local shops. I know a lot of us at that time would just spend hours walking up and down the video aisles looking at the incredible box art on some of the titles here, sometimes stumbling upon some gem that we rented just because the box art. But how did we go further than just the glorious video art in searching out movies worthy of our attention? Reference books. 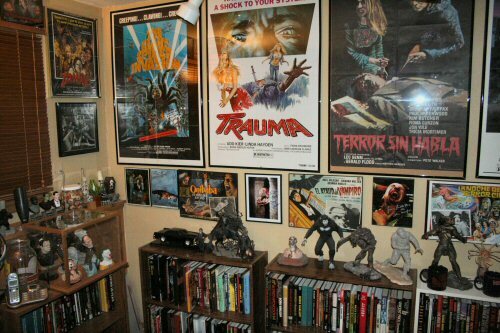 I would add every reference book I would come across that dealt with horror movies to my library. Then I would go through the book and look for something that sounded interesting. When I found one, I would add it to the “to find” list. Or if I seen a movie that I enjoyed, then I would seek out maybe some of the other films that had the same director or actor. The two books I probably used the most were Michael Weldon’s Psychotronic Encyclopedia of Film and the Overlook Film Encyclopedia of Film by Phil Hardy. Not to say that I didn’t consult other volumes, but those two were the staples and ones that I always went to first. 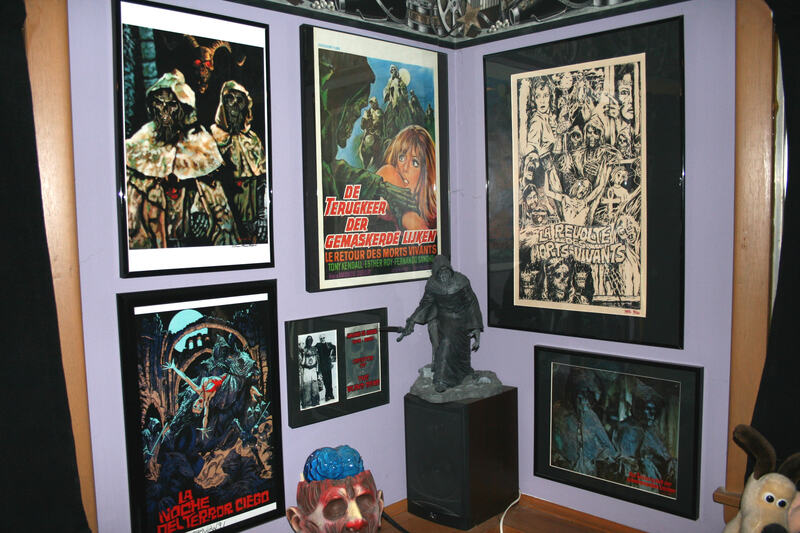 It was during this time that I started getting into the dreaded obsession of collecting horror memorabilia. My friends, this is an evil thing. Once you get started, there’s no turning back, and there’s no stopping it. Many (and I do mean many) years ago, I used to be content with just collecting movies on video tape, dubbing them off on to VHS to save the money from buying them (I told you it was years ago). Then you start to think how cool the big clamshell boxes that some of the movies came in would look sitting on your bookshelves. Then you buy a movie poster. Just one or two for a little decoration. The next thing you know is that you have enough posters to wallpaper your entire house…twice. Then you move into stills, lobby cards, books, and it just goes on and on, sucking every last penny that have you have. Well, maybe not that bad. It just depends on how much self-control you have. So in other words, I collect. In the beginning, I would collect just about anything. But over the years, I’ve learned to curb my tastes and limit myself of what I’m looking for….unless it’s cheap enough. But I still collect these days, but it has slowed down a bit, mainly due to money (or lack their of) and room. My office here at the Krypt used to have room for 7 one-sheets hanging up. But because of the number of volumes in my library being increased over the years, most of those spaces have been replaced by bookcases. I still pick up things here and there, like posters and such, but have gotten a little more selective these days. And now about the site here. I started Kitley’s Krypt back in October of 1998, which makes it one of the longest running horror websites on the net. Over the years, I’ve had a few remarks of why I put my name in the site’s title, which is pretty easy to explain. I stand by what is on this site, both in content and opinion. Unlike some sites, I don’t hide behind some fake name or persona. What you read is what you get. I make no apologies for my opinion here. It is just that…my opinion. If you don’t agree with it, that’s fine. I won’t be offended or have a problem with that. We love nothing more than discussing different opinions on the movies. Like they say, we don’t have to agree on every movie, as long as we agree on the genre as a whole. The Krypt has changed over the years, but my main goal has always stayed the same, and that was to ‘spread the disease’ in promoting the genre. I want to help other fans learn more and more about the amazing and thrilling genre of cinema. Since I’m slightly obsessive and a completist , I’ve always tried to continue to expand my knowledge of it, really becoming a life-long student of the genre and its history. I created this site using Microsoft Front Page 98, upgrading the program each time Microsoft released an update. Their last update was back in 2003. Their next update was now called Expression Web and for me, took what use to be a very basic and easy-to-use program into something much more advance. Keyword term here…’for me’. As much a I tried to make the jump to Expression, I just couldn’t figure it out. So I continued with Front page. But then I slowly started to run into issues. I had to change web hosts twice because they stopped offering Front Page Extensions, which one needed to have them host a site created with Front Page. Then Windows 7 came along and the old Front Page was not compatible with the new operating system. But thanks to my computer whiz nephew, he was able to get it to work. But then Windows 8 came along, which I’ve been told will not work with Front Page. So I knew it was only a matter of time before using Front Page would become completely obsolete. Knowing that the end was not to far away, I decided to look into other options while the site was still running and have the luxury and time to make the transition. At first, looking to going to a blog format seemed like a huge step backwards since I was assuming blogs were a simple one page news feed type of site. But the more I looked into it, I was amazed at how much they have transformed into actual full functioning websites. So that is where we are at now. The old site is still archived (with a link on the right) but I will be slowly bringing that content over here. But while the format might have changed, my goal and mission for the Krypt has not. I still hope to Educate, Expand, and (hopefully) Entertain our readers and their knowledge of the horror genre, helping them to Discover the Horror. EDUCATE – So many fans that I’ve run across over the years seemed to have a limited knowledge of the genre. This is not to be taken as an insult or trying to sound like we know everything. We are still learning ourselves. Yes, most horror fans know who Peter Cushing, Vincent Price, and Boris Karloff is. Those are the basics. But what about Bernard Robinson? Or how about Lionel Atwill? Or maybe even Ted V. Mikels? As you increase your knowledge of the genre, you will learn more and more about the people behind these movies. Whether they are actors, directors, makeup artists, production designers, or even cinematographers, there are some talented people out there that have given the films the look and feel that they have, and are still remembered today. Whether these movies and/or actors are 100 years old, or 2 years old, it’s important to know your history. It helps you appreciate the past, as well as the present. EXPAND – Fans know what they like and like what they know. But what about the movies they don’t know about, or maybe never even heard about? Isn’t there a chance that there could be more movies that they’d enjoy out there? Some fans want to complain about the lack of anything good in the horror genre coming out today, and some times I have to agree with them. But there is so much out there that they haven’t discovered, myself included, that even if all the new stuff is crap, there is still plenty of good stuff out there to see. So with this site, we’d like to help those viewers find new favorites, and expand their tastes of the genre. ENTERTAIN – And lastly, the part that we hope everyone does find, and that is some sort of entertainment here at the Krypt. We have our Mystery Photo and Trivia contests to throw some fun tests out at you, as well as our rantings, Psycho-Babble, and other opinions, misguided as they might be. On a personal note, besides running the Krypt, I also write for HorrorHound Magazine (where my column won a Rondo Award in 2013 for Best Column) and Evilspeak magazine. 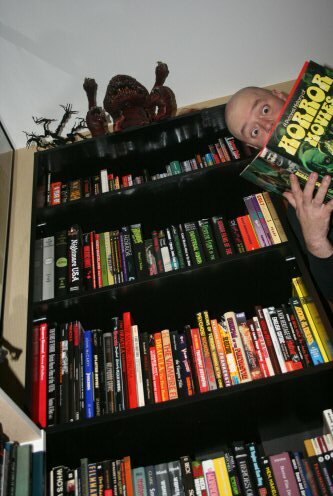 My work has also appeared in two books, Horror 101 and Hidden Horror (which was awarded a Rondo for Best Book in 2013). You can also see me at about a half-dozen conventions throughout the year. I think I’m going to like it here. And yes, I need more education! Haha.